This is a how to page for Gqrx an "open source software defined radio receiver". Gqrx has many bells and whistles, one of which is the ability to listen to "raw" IQ files, speficially, "raw" IQ files from RRI. This page is desinged to help set-up and listen to "raw" RRI IQ files using Gqrx. 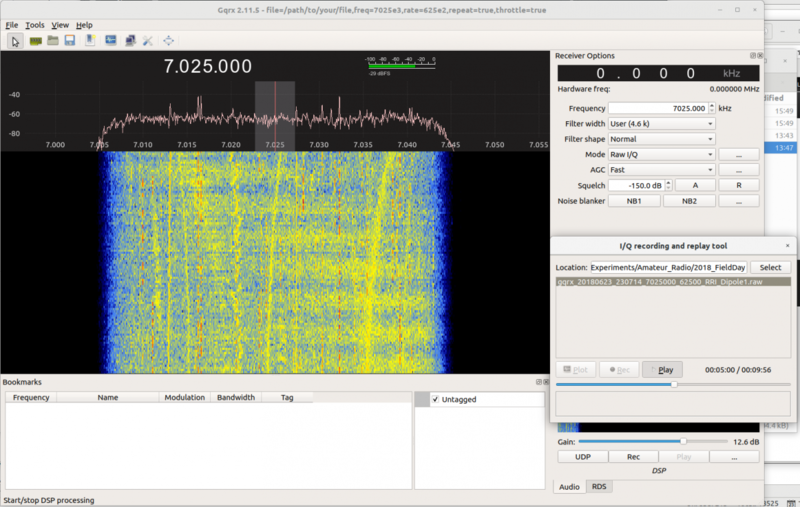 Currenlty, Gqrx is available for Linux, and some instances of Mac OS. Information about that can be found here. This instructions and screen captures shown here are from Ubutu 18.04 LTS. These instructions will be very similar - if not identical - for a Mac Gqrx install. 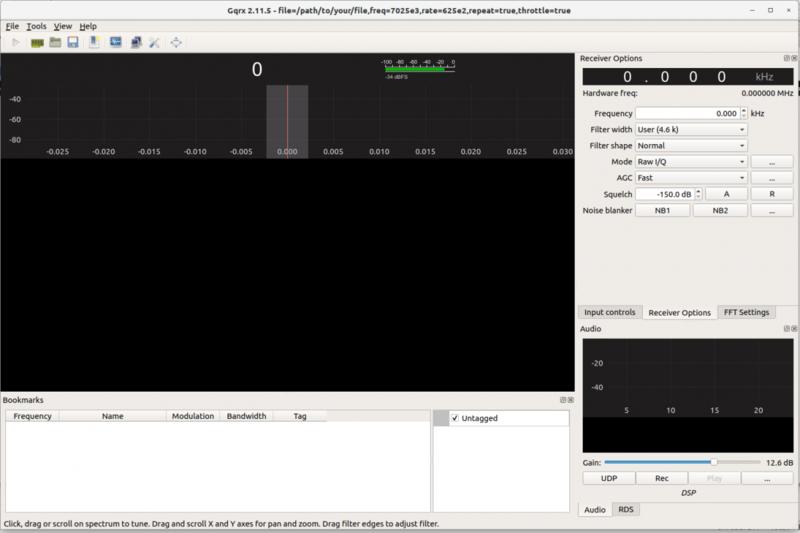 Gqrx may be downloaded directrly from the site, or it may be installed through the normal Linux APT software. Gqrx user support is provided via a Gqrx Google group. As you will see, Gqrx has lots of options and settings. Here we are only concerned with playing "raw" I/Q files assoicated with RRI's dataset. When starting up Gqrx (assuming that your install went smoothly) you should see something similar to the following screen-grab. The raw I/Q files do not contain any metadata. RRI's settings related to the data file must be manually entered into Gqrx. To do this, click on Configure I/O devices icon on the left side of the toolbar at the top of the window, as shown (the incon looks like a piece of computer hardware). Then enter the important information contained in the file name of the RRI raw file into the Configure I/O devices window. For example, here we have entered information for an RRI data file that was recorded at 7.025 MHz. Under Device String, the field freq=7025e3 (7025 kHz = 7.025 MHz) and rate=625e2 (625E2 Hz = 62.5 kHz) are the only fields that have been changed. Under LNB LO enter the tuned frequency RRI was at, in this example LNB LO = 7.025000 MHz. Ensure the Audio Output settings are correct so that you'll be able to hear the audio. Next, to load up an RRI raw IQ file, click on the Record and play I/Q data icon on the top toolbar (the icon looks liek a screen with a voltage trace). In the Record and play I/Q data window, be sure to set your path to the audio file correctly. When this is done, you see all of the files in the *.raw format. You will then be able to select the file you want to play. To play the selected file, hit Play in the I/Q recording and replay tool. Ensure that Mode in the Receiver Options panel to the right is set on Raw I/Q. Then select the Start DSP processing icon in the top toolbar (the icon looks like a traditional 'play' button). The raw IQ audio file should start playing. You should see a waterfall plot similar to the one shown below. Notice that the I/Q recording and replay tool has a timer and a slider which allows you to locate and reposition your place in the audio file.